I’m going to make this brief since I only have a few minutes left before leaving work for the barn. I had a lesson on Saturday in which my trainer made sure I was doing the lunging properly. There really is a lot to it when you’re using it as a teaching/training tool and not just for non-riding exercise or to let the horse blow off some steam. She made sure I was holding the “rein” properly and complimented the timing of what essentially amounted to half-halts. After that, I felt much more prepared to tackle it on my own and start working with him more often. 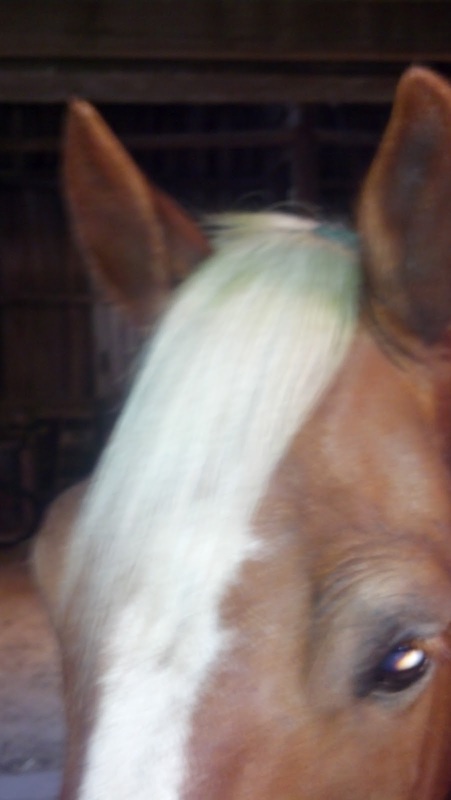 Flaxen mane and forelock = awesome grass stains. This one went all the way down his mane, starting from here. He felt much better, and I left the lesson feeling like we’re both headed on the right track. I am riding him in a hyper-aware state right now, constantly analyzing the feel of the contact in both arms and the position of my body in the saddle. It feels like “riding on eggshells,” but it also feels like improvement. She’s asked me to bump up my barn days to four days a week, which I knew I had to do and don’t mind, during which I will be lunging for most of each ride and doing some more slow work under saddle during the last ten minutes, mostly to work on a bit of the new feel, but also I think to keep me content. It felt so strange to swing a leg over my pony for the first time in two weeks on Saturday, and that strange feeling made me realize how much I’ve missed it. Ground work is fun and necessary, but not enough! Tonight I try the Stackhouse on him – looks like it will be too narrow so I am quite nervous. Wish me luck! If you ever see a copy of Centered Riding by Sally Swift read it. It helps with body position and gives good mental pictures. Mom was fortunate enough to have two lessons with her before she passed. Sally really reminds people to look at how they operate outside of the barn, like your Crossfit or how you sit at your desk or in your car. If you can be aware of making your position equal during those times it helps while in the saddle. I agree that ground work is fun, but sometimes you just need to be in the saddle. I will keep my fingers crossed about the Stackhouse. In all that free time and with all that spare money we equestrians have, you might check out pilates. It's helped me a lot with recognizing and correcting body imbalances. Another excellent riding tool: having a barn buddy who is a physical therapist. While not available to everyone, these folks are VERY perceptive and useful.